With numerous gold silver and bronze awards under our belt we are proud to announce that the technology that we have used to produce much of our award winning print work, is now officially patent protected. We owe the crispness of our embossing and debossing, as well as the ability to achieve fine, clean lines and complex sculptural embossing, to this newly patented system. This job (pictured) was recently printed by us for the Australian fashion label, CUE, on Ispira black by Spicers and blind embossed using this wonderful technology. The beauty of the job is the simplicity of the concept; a luxe stock embossed with a unique design. It’s a visually striking approach to print and our clients have found again and again, a cost-effective way to do something completely original and interesting. 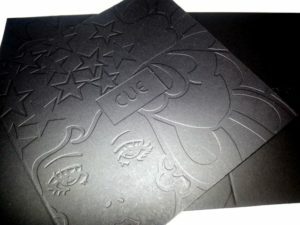 Embellishment-driven design concepts are really satisfying for designers, always deliver great results (case in point with the CUE gift voucher piece) and, we have found, catch the eye of print awards judges, to boot! Currently, the results we achieve with this technology are unique to Watermarx Graphics, because we are the only printer in NSW using this system. That said, we are trying to work out the best way to bring this technology to market so that other printers can offer their clients the great results we have achieved with it …So, watch this space! Sydney’s Northern beaches are an underestimated and exciting, emerging hub of creativity. There is a growing army of talented designers and boutique graphic design studios popping up in the homes, offices and share spaces in this neck of the woods and we are proud to service many of them. Watermarx Graphics has been established here in Brookvale (Brookie!) close to the gorgeous coast and proudly north for nine years now. During that time there have been many newcomers to the creative print design scene and who can blame them? The location is fantastic, and if you like the surf like Al does (look at him being all Ironman in this pic!) then it’s the best spot for lifestyle. We’re proud to have serviced the many wonderful creative people here, and to be considered the go-to printers for specialty embellishments, letterpress embossing and foil stamping on the Northern beaches. We have been working on our technology for many years, as we have striven for excellence in the finished product and smiles on our customers’ dials. The result has been many great collaborations (and more than a few awards claimed on the way) with our local clients. Adding decorative details like the range of print embellishments we offer can help your work stand apart from the rest. We can work with you at the earliest stages of your design concept to find the best, most exciting, visually appealing and economical way to incorporate foil stamping, letterpress or embossing into your work, enhancing the overall product for your clients. Of course, while we love our happy home here, it bears mentioning that we work with graphic designers all over Australia. We often consult over email or the phone, and thanks to the magic of the web, can have a job printed and shipped off to our clients anywhere in the world. We even get interstate visitors who like to check out our machines and set-up. We’re always happy for designers to pop in for press checks and welcome them into our busy hub of foil stamping embossing and letterpress on the Northern Beaches!